Today's guest speaker, Jim Behnke—an Airborne Ranger, author, Lutheran minister, a volunteer with the Jail Ministries, a volunteer with the Sheriff Assist Team, owner of the $3.2 million-dollar rescue helicopter. Jim described the historical background of Mexico beginning in 1519 with the Spanish occupation. The Mexican revolution which began on September 16, 1810, resulted in the overthrow of Spain. For the next 30 years after the overthrow of Spain, Mexico went through a huge number of governments as every general who thought he could, established a coup—General Santa Ana sponsored at least 11 of these. Eventually, Mexico was unable to pay off its foreign loans to Spain, England and France. England and Spain agreed to accept Benito Juarez’ offer to have the British take over the Vera Cruz tax and customs offices and tax the incoming and outgoing goods until they had repaid the debts. France, on the other hand, decided to invade and colonize. The U.S. could do nothing as they were in the middle of the Civil War. Halfway on the way to Mexico City, the well-trained French Army of 6,000 professional troops was defeated by the 2,000 poorly trained, heavily volunteer members of the Mexican Army at the battle of Puebla on May 5, 1862. The French regrouped and defeated the Mexicans and installed the French Prince Maximillian as emperor. The King of Belgium sent along a regiment of cavalry to protect Maximillian and his wife, Charlotte (also known as Carlota) who was the King’s daughter. She was having an affair with the cavalry officer. Maximillian was captured and executed by the Mexican government in 1867. Charlotte returned to Europe to attempt to secure help for her husband; after he was executed, she lost her mind. She had a boy who was adopted out; his name was Maxime Weygand and he was later the general of the French army in both WWI and WWII, surrendering to the Nazi Army. Jim also told the story of the start of the Santa Fe trail—that began because Mexico was not allowed to have its own factories. All the freighters and businessmen took items from the northern states to Santa Fe, NM to sell items. 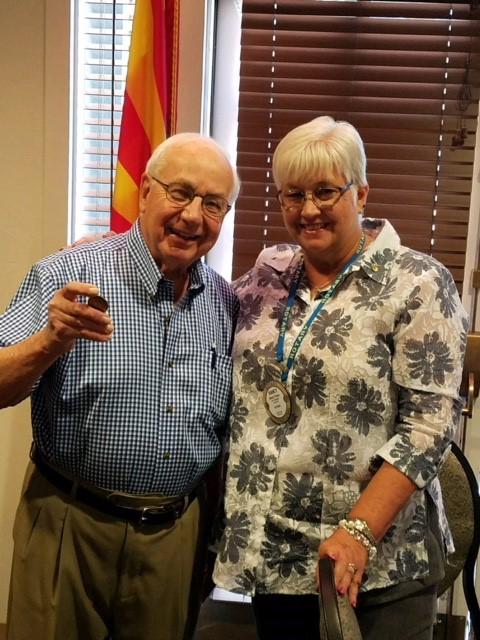 President Nancy gave Jim a Rotary coin and advised him that the Club would be donating a book in Jim’s name to the Boys’ and Girls’ Club.